This page is for items that only retail stores would use. Items like shelf tags, decorative boxes that display merchandise & posters. Other items like cardboard stand-ups, hanging signs, window stickers, store-issued posters & other items made especially for retail outlets should also be here. These items & other POP (point of purchase) displays are used to attract customers, dispense merchandise & advertise inside of stores. Sometimes, once the items are done with, fans have the ability to collect them. 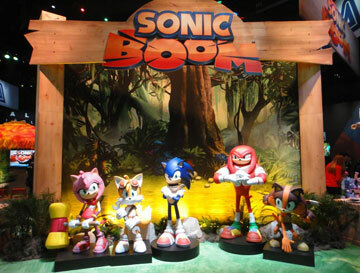 Here are some Sonic Boom toy display boxes. These boxes are meant to dispense packaged figures / hold the figures on the shelf. They're just a simple cardboard. That little cut-out of the cast in there is meant to represent where the toys would go. 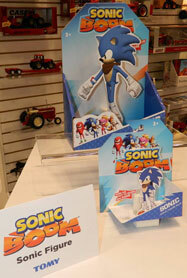 Same with the Sonic mini 'standee' in the front box. 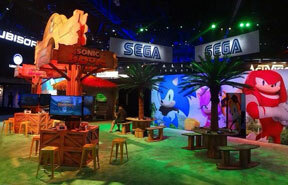 The left photo shows more of an overview of the booth, with big character background, Sega signs & how the playing areas were laid out. 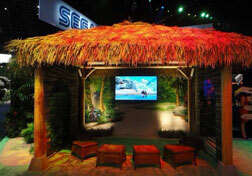 The grass texture on the floor may be created via overhead textured look lighting. In 2014, Chevy wanted a presence at the New York Comic Con. 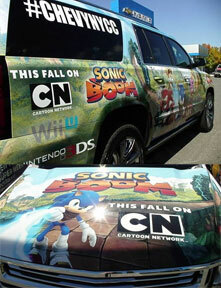 They had "ad wrapped" trucks parked & attending the area during the con. 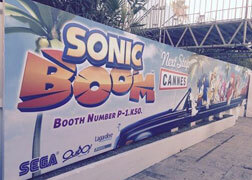 (Ad wrap is a special plastic that can go onto cars like a giant sticker, with whatever you want printed) This one is a giant ad for Sonic Boom, both the show, and the games. It has logos all over, scenes from the show & says "This Fall on CN". Could you get game or show info from the truck? Did it do anything or was it just a visual billboard type display thing? also an ad. It has the booth number as well, but you can get a better look at the graphic. It has a really odd/long car with Sonic at the wheel. Tails & Amy are next, Knuckles doubts his black bow-tie, Sticks is getting ready to throw her boomerang at Eggman who is clinging / climbing the back of the car. There's a paragraph in white at the top, but what does it say? 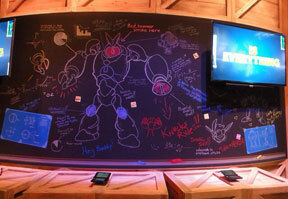 This is sort of a display & sort of a prototype at the same time. 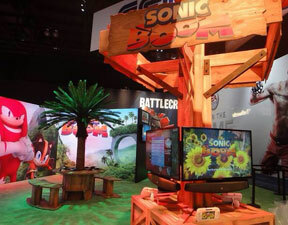 It's a teaser item for Boom, back when they were just previewing the new boom-designs with the shadows of the characters. These large cardboard stand-up rectangles are made to surround columns in a convention or ball-room setting. The logo, as you can see, isn't the final one, it is instead blue with white. 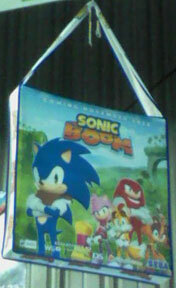 This is a poster/picture showing you the various toys you can get in kids meals at Hardees Carls Jr.s restaurants for the release of Sonic Boom Fire & Ice on the 3DS. 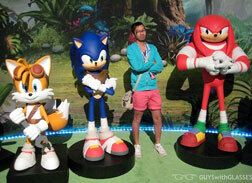 The items include a splat ball (soft foam ball that fills with water when squeezed under-water and then if you throw it, whatever it hits gets soaked) Sonic 'figure', which....is very tall? And semi-transparent blue plastic, a whole board game (! ) and a communicator with secret compartment. 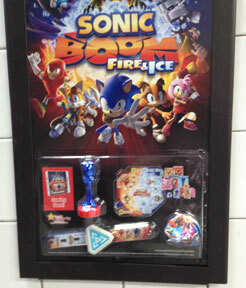 Here's the actual display for the Boom Fire & Ice promotion inside a Hardees Carls Jr. Restaurant. The wall itself (that white tile) has a panel built in that holds a poster & the display box/window for the current promotion. You can see each of the items in the above poster displayed here in the plastic box. The little item with the star above the watch at the left is the restaurant logo, which is always there. 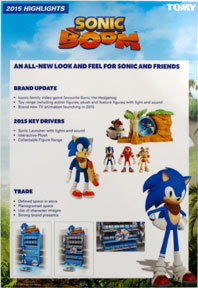 This is a poster that appeared at the Neuremberg Toyfair in 2015. It's technically not a store display, but it has a picture of one on it. 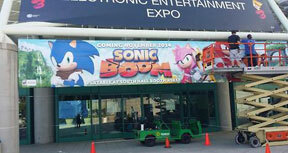 The poster has some photos of the toys, a CG Sonic image & pictures of a cardboard display like item that may or may not have actually gotten made. 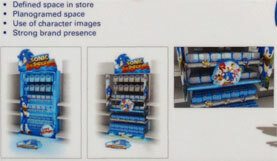 It proclaims that the talking plush, collectible figures & launchers will be the leading items. The description of the cardboard display claims that it will be 'defining the space in the store, and creating brand prescence'. Did the display actually appear in any store in the USA or Europe?